After finishing the power supply, it is time for the next module: the receiver. That will probably be the most complex part of the project. Not only electronically, but also mechanically. While the paint was drying on the power supply, I started to have a look at the receiver. The original receiver: the 2 subchassis are clearly visible. 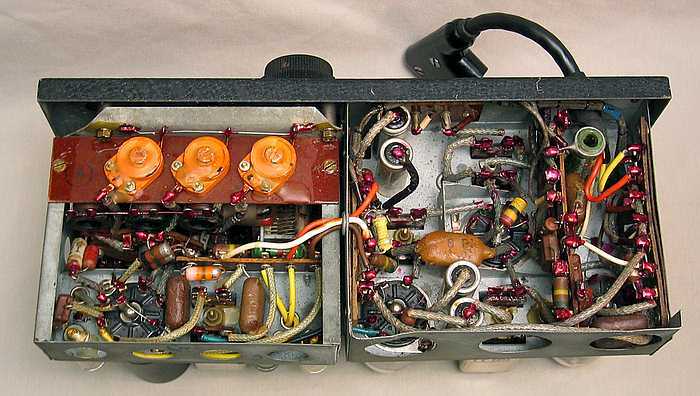 The right chassis (looking from the rear) is the actual receiver with HF amplification, Local Oscillator, mixer (all taken care of by just 1 valve) and the first IF-transformer. 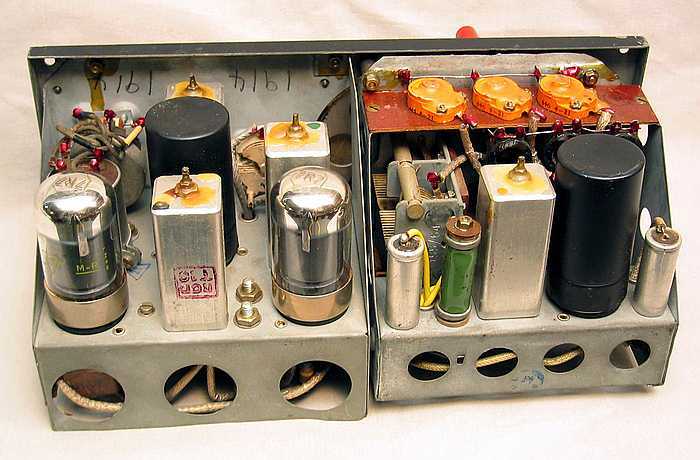 The left chassis contains the IF part with BFO and audio amplifier, all done with 3 valves. Especially the right chassis is complex: it has been build in 3 layers and is very compact. The tuning dial is behind all that, driven by a string and vernier dial. And then 3 variable inductors for the receiver frontend and 3 variable inductors for the Local Oscillator, plus a double IF-transformer at 470kHz. That will be the biggest challenge. Because I already obtained a very nice vernier dial on Ebay, I did not have to make a string-driven tuning dial. The dial can be connected directly to the spindle of the tuning capacitor. That still leaves the dial to be driven. Therefore I ordered a couple of gear wheels at Conrad. Mans PA2HGJ was so kind to remove unnecessary parts from the plastic gearwheel on the lathe, and now I have a nice gearwheel that will be mounted on the spindle of the tuning dial. Con: the original tuning dial is 45mm in diameter and mine 72mm... Pro: In return I get a 1:90 speed reduction. The hole on the upper left is for the antenna connection. If the receiver is used stand-alone, that is where the aerial is connected to. If the receiver is used in conjunction with the transmitter, a wire with a banana plug that comes from the transmitter is connected to this terminal. The big hole is for the tuning dial. Left of that is the hole for the bandswitch. 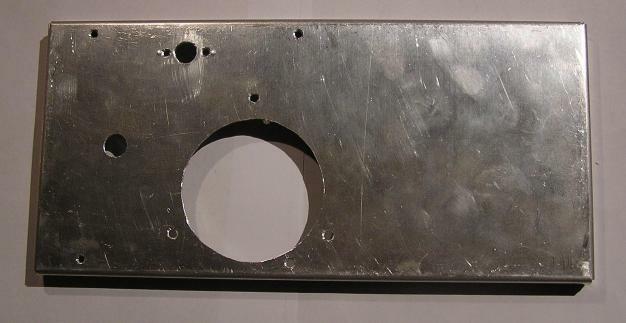 The four M3-holes in a rectangle are for mounting the sub-chassis. 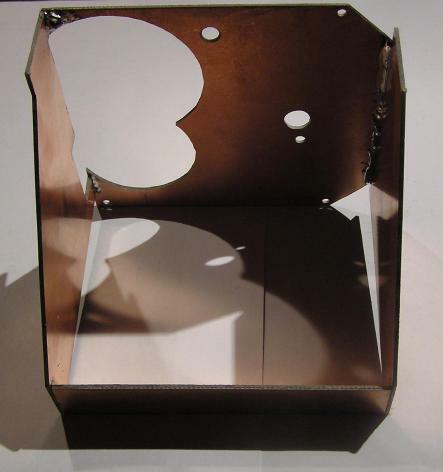 That is mounted with 5mm spacers, which hides all mountingnuts and -bolts behind the lid. Except the antenna connector, which is mounted directly to the lid. My subchassis are made of double sided printed circuit board. Firm and yet easy to process. Before mounting the parts, I will paint the PCB gray, so it looks like metal. First I have to temporary mount the tuning dial, to bring the capacitor in line with the dial. That will be tricky. And then the second subchassis can be made. The gearwheel that will support the dial is placed as close to the front as possible. Top view of the second subchassis. Rear view. Everything fits fine. Front view. On the right the volume potmeter and the hole for the power supply cable; on the left the hole for the spindle extender and the phones socket. Except for some 0.1uF capacitors, all components are ex equipment. I soldered a couple of wires with banana plugs to the IF subchassis and connected the HF generator with 1nF to the IF input, after tuning the generator to exactly 470kHz. I powered the filaments first and waited an hour before applying the 250V. The valves have not been used for at least 40 years, if used at all, so I gave them some time to get used to their new job. Bias and 250V connected; time for the smoke test. Rear view of the IF/AF part. Adjusting was no problem at all. The "volume"-potmeter does something more than just attenuating the audio. If you look at the schematics, you will see that it actually does not attenuate the audio, but changes the negative voltage of the first three valves. The final amplifier is the only one with fixed negative. By changing the negative voltage on the valve's grids the amplification changes also. But also the feedback of the second valve to the IF transformer! I made the 6pF feedback capacitor from a small strip of double sided printed circuit board by cutting it until I reached the required value. The sensitivity was between 3 and 10 uV using a 30% Amplitude modulated carrier. And that is without the preceding stage. Pretty good, if you ask me. For the details: interior without flashlight.